Factory 93, Insomniac’s dedicated underground home, is kicking off the New Year with our first official event of 2019: a very special night with the legendary Maceo Plex, taking place Saturday, March 16, at the Factory 93 warehouse in Downtown Los Angeles. Tickets for Factory 93 Presents Maceo Plex go on sale Friday, January 25, at noon PT. As the next installment in our Factory 93 underground warehouse series, the event, which is part of his 2019 Mutant Tour, marks Maceo Plex’s first Los Angeles performance in almost six years. For this special daytime-into-nighttime event, running from 3–11pm PT, Factory 93 will return to its outdoor, industrial aesthetic previously showcased at its inaugural Secret Project Festival, which took place at the Headliner-favorite warehouse space last October. Expect Maceo Plex to deliver his signature “dark and deep techno and house” sound in a blistering four-hour set, all set against the Downtown L.A. skyline. The night will also feature opening sets from Solar, Emile, and Gerard Not Gerald. Best known for his diverse production styles, Maceo Plex has had a sprawling career that dates back to the early ‘90s. Experimenting with hardware modules to form his early musical compositions, Maceo grew into a technologically advanced being, later to be known by various names such as Mariel Ito and Maetrik. After many years of prolific work with labels like Treibstoff, Cocoon, Audiomatique, and his very own Ellum, Maceo Plex continues to strip back his robotic body armor to reveal a more musical and groovy side. Mark your calendars now: Tickets for the highly anticipated Factory 93 Presents Maceo Plex show go on sale Friday, January 25, at noon PT. 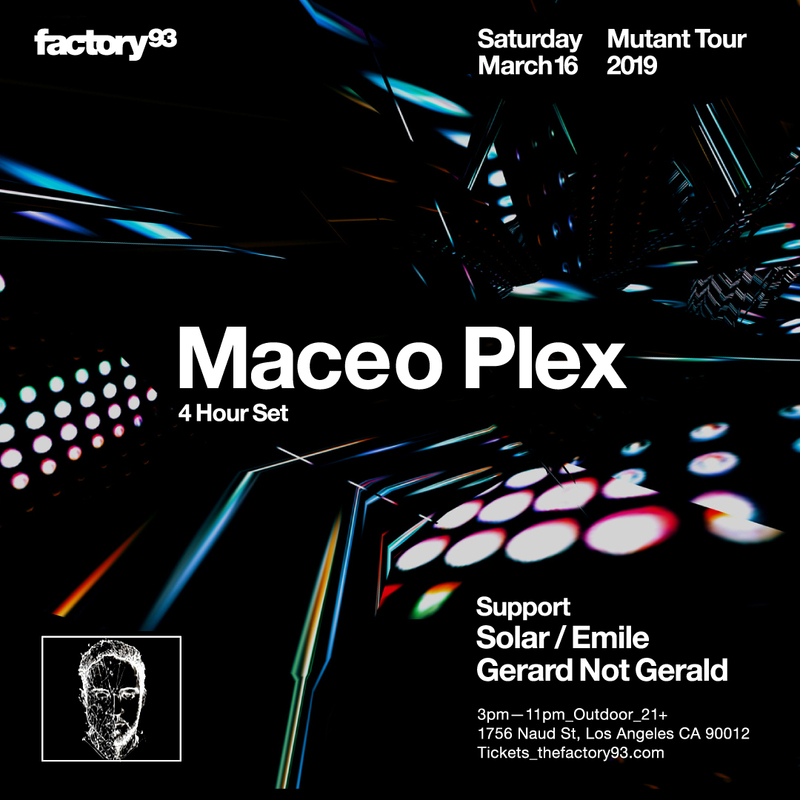 Factory 93 Presents Maceo Plex takes place Saturday, March 16, at the Factory 93 warehouse in Downtown Los Angeles. Tickets go on sale Friday, January 25, at noon PT. For more information, visit the official event page.